10 vs 12 miter saw which one do you need and how do they differ apart from the obvious blade size? I you are looking to treat your self to a new miter saw for you woodworking shop or are a busy pro on a job site you might be torn between a 10 inch or 12 inch miter saw. As stated the obvious difference will be in the blade size. But, is blade size alone the only difference? ​In short they will differ in their cutting capabilities and what they can be used for. ​A ten inch miter saw is usually used for more detailed work, but why? Because the smaller blade can spin at a higher RPM all things being equal. The blade will generally have smaller, finer teeth on it. Like any cutting tool or saw the finer the teeth and the higher the RPM​ the finer the cut you can make, assuming the blade is suitable for the material you are trying to cut. The larger 12 inch miter saws are almost always going to better than the 10 inch at cutting thicker stock. They have a bigger capacity, are generally larger, more bulky machines which also means they are a little more solid too. The 12 inch miters also will usually have a more powerful motor. The average power of the motor in a 12 inch miter will be about 15 Amps. That is not always the case on a 10 incher. 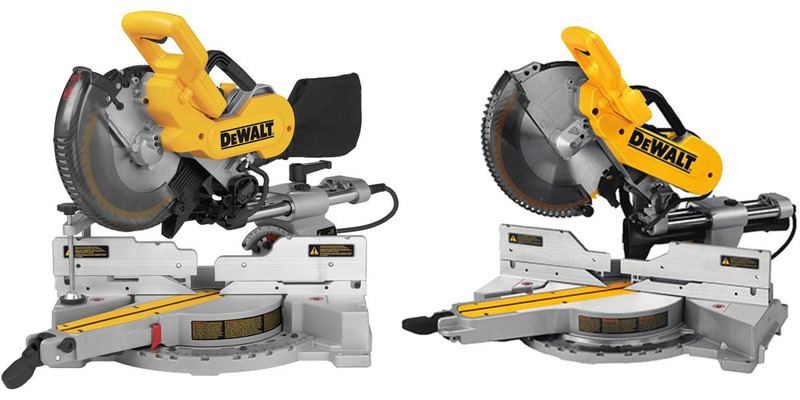 ​Lets take a look at the 10 inch and 12 inch miter saw offerings from DeWalt, the DW717 and the DWS779. The DW717 is a 10 inch double bevel sliding compound miter saw. It has a 15 Amp motor that can spin it's blade to a max no-load speed of 4,000 RPM. It has a miter range of sixty degrees to the left and fifty two degrees to the right. It is a double bevel miter saw so you don't have to flip your work piece over to make the opposite cut. There are seven positive ​stops on the bevel detent system at the most popular angles. The DWS717 has a tall fence which makes working with larger pieces a lot easier. It is roughly 22 inches wide and at full extension you get a full 37 inches of work surface. ​Cutting capacity on the DWS717 is pretty good for a 10 inch miter saw. It can handle crown molding up to six inches. The DeWalt DWS779 is a very popular 12 inch sliding compound miter saw. It has a double bevel design that has positive stops at 0, 22.5, 33.9, 45 and 49 degrees. The bevel ranges from forty nine degrees from the left through to forty nine degrees to the right. On the miter front the DWS779 ranges from fifty degrees to the left and sixty degrees to the right. The newer version of the DWS779 is the DWS780. It is essentially the same miter saw with the exception of the inclusion of the XPS system. XPS uses a bright LED shone along the blade to cast a shadow that is perfectly in line with the blade. ​Who should buy a 10 inch miter saw ? Anyone that does not need the ability to cut large crown molding on a regular basis. A 10 inch miter is more than enough for the average home woodworking shop or garage. Also those that need to make extremely accurate cuts where the quality of the cut really matters, so quite a few furniture makers will favor the 10 inch miter saw. Who should buy a 12 inch miter saw ? A 12 inch miter is usually found in a busy commercial wood shop. However there are plenty of home DIY/woodworkers that will always opt for the larger blade diameter. Just bear in mind that quite a few 12 inch miter saws will allow you to replace the blade with a 10 inch one. In this scenario you get the best of both worlds.